1. R.S.V.P. R.S.V.P. is French for, “répondez, s’il vous plaît,” which means “please reply.” The person sending the invitation just wants to know whether or not you’re coming to the event. A simple YES or NO is all they’re looking for. Sadly, most folks only seem to respond if they are attending. 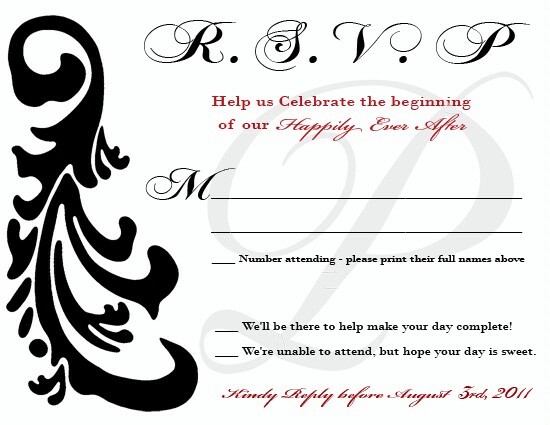 As a common courtesy, RSVP ASAP but no later than the deadline (and be sure to complete the card in its entirety). The host needs to know how many guests to expect for planning purposes (food, set-up, etc. ), so when an invited guest doesn’t respond, it pretty much drives the host nuts. More importantly, is the simple courtesy of responding to someone who was nice enough to invite you, even if it is to say you are unable to attend. 2. Fill in the blanks. It’s pretty common to see this on an RSVP card: “M_________________________”. Any idea what this is for? Your name! The “M” is for Mr., Mrs., or Ms. So, if your name isn’t already written in, just fill in the blank (ie., Mr. and Mrs. John Doe). Whatever you do, do NOT write in the name of someone to whom the invitation was not addressed. If the person wasn’t invited, don’t go inviting them yourself (unless the host states otherwise). 3. Dress for the occasion. Invitations to weddings and other special events often state if the attire is formal, semi-formal, black tie, etc. Be sure to honor the wishes of your host(s) by dressing appropriately. And you’ll do yourself a favor by not being eternally etched in the wedding album as one big fashion faux pas. You’ll carry yourself quite confidently throughout the event and your host will appreciate the effort you put into presenting yourself respectfully for their special occasion. After all, you are a reflection of those who invited you… when you look good, they look good. Dress it up! 4. Arrive on time. If the wedding starts at 1pm, arrive by 12:30pm. This will give you time to park, find a good seat, and get that camera ready to snap away! Showing up “just in the nick of time” will pretty much guarantee that you’ll be standing in the hallway as the bridal party processes down the aisle. That’s not too exciting, if you ask me. 5. Don’t bring unconfirmed guests. If you’re attending a formal event, chances are there is a seating chart with place cards awaiting your arrival. Bringing unexpected guests may not only prove embarrassing for the guest, but it may also jack up the entire seating arrangement (and the bill!). And if kids aren’t invited to the event, don’t try to sneak them in or use the “she’ll just sit on my lap” excuse. If the kid wasn’t invited, leave Her Cuteness at home with the sitter. Honor your host’s wishes by following the rules. 6. Give a gift. Although it is not mandatory to give the newlyweds a gift, it is expected that you’ll give something. Purchase a gift from the couple’s gift registry (and mail it to them prior to their big day- that way they won’t need to make arrangements to get it home), or give them a check. How much should you give? Personally, I would give at least enough to cover the cost of my meal (and double that if my husband and I are both attending). The closer you are to the couple the more you should probably give/spend. If that’s not within your budget, give what you can reasonably afford. Even a heart-felt card can go a long way. Just don’t go empty-handed. 7. Let the pro’s do their job. Anyone who knows me knows I love, love, LOVE taking pictures! I am truly snap happy. But I’m not a professional photographer, so I know to stay in my lane when it comes to taking pics at special events. If a photographer/videographer was hired to capture the Kodak moments, get out of their way. Let them do their job. This goes for the DJ as well. Don’t go compiling a list of special requests for the DJ to play. This is not a house party! 9. Stay sober. I know, you’ve been a good boy/good girl all day and now you’re ready to let loose! You’re surrounded by beautiful people, great music, and free drinks. Time to drink it up and live it up, right? WRONG! With camera phones, Facebook, and Twitter all just a point and click away, you do NOT want to be that guy/girl who got sloppy drunk at the soiree. Once you discover that your slurred speech, goofy smile, and incessant ability to “drop it like it’s hot” have spread like wildfire around cyberspace, you’re sure to suffer a hang-over like no other- one filled with harrowing humiliation. 10. No doggie bags! As with the previous 9 tips, this one really should be common sense… but it sooooo is not. Look, unless you’re attending a barbecue or an event at a TGI Friday’s type of restaurant, please don’t ask for a doggie bag. If cake bags are given out, that’s fine. But doggie bags? Not so much- doggone it! What etiquette tips would you add to this list? Knowing (and adhering to) the proper protocol for various social settings will enhance everyone’s social experience. The next time you’re presence is requested for a special occasion, be my guest… put these tips to the test! This entry was posted in RESPECTFULly Yours and tagged Wedding Guest Etiquette by The Practical Chick. Bookmark the permalink.